The Ping Sigma G putters are precision milled from 6061 aerospace-grade aluminum and feature the new True Roll Face Technology with a new pattern that varies in depth and pitch to improve performance and touch on any putt. An innovative lightweight, elastic Pebax elastomer insert covers the entire hitting surface to deliver a uniquely soft yet responsive feel. The larger face insert cavities increase impact stability on every model while the optimally placed CG positions help to reduce skid and initiate forward roll. With a softer feel and consistent ball speeds, the Sigma G putters will help you to sink more putts more often. Shows virtually no traces of wear, may have been hit one or more times in controlled conditions. May show signs of very minor "shop wear" (i.e. a single cosmetic blemish), but still full of NEWNESS! Clubs have seen minimal usage and are in top of the line preowned condition. You may see some minor or faint cosmetic blemishes (i.e. very light scuffing and/or scratching). Typical wear that you will see on an Excellent condition club is normal ball marks that are lightly visible on the face, minimal scratching to the crown, sole and edges. Shaft has no noticeable wear. Clubs have seen normal usage for an extended period of time or at least one season, the wear you’ll notice will be typical of the age of the model. All of the wear is purely cosmetic, and will not in any way affect the performance of the club. Typical wear you’ll see on a Very Good condition club is normal ball marks and scratching on the face, normal scratching on the sole, faint dings and nicks on the crown and/or around the edges of the head, light scratches, paint chips, paint blemishes on or around the crown. Shaft has minimal wear. Clubs offer a great value for someone who isn't as interested in cosmetics, but cares about performance. Shows frequent to heavy use, but does not show any signs of abuse. All clubs in Value Condition are in 100% playable condition, which is the perfect option for the player looking for more bang for the buck. Typical wear you’ll see on a Value condition club is moderate to heavy ball marks and scratching on the face, moderate to heavy scratching on the sole, moderate to heavy dings and nicks on the crown and/or around the edges of the head, moderate to heavy scratches, and paint chips/ blemishes on or around the crown. Shaft will have noticeable wear. Grips will be consistent or better than overall club grade. Unplayable grips have been removed and replaced with new grips in some instances. Iron sets will have matching grips throughout the set. If purchasing as individual iron(s) or purchasing set matching wedge(s) grips may not match. Some clubs may be gripped with grips stating “Demo” or “RockBottomGolf.com”. We do not guarantee grip size on pre-owned equipment. The driver looked like it just came off the rack at a store and came with the head over. Shipped in less than a week. Fast shipping and the wedge was exactly as described. Rock Bottom Golf has been a great buying experience. Pros*Current model wedge *Less than half the price of our pro shop or at other online dealers *Condition was exactly as described. I don't believe a better hybrid exists than the G15, and to get one in like new condition for an unbeatable price couldn't be passed up. Received my right handed �€œlike new SLDR 3 Hybrid today. �€œLike New�€ might as well be brand new. It�€™s flawless and mine included a head cover. Haven�€™t swung it yet but seems like another steal from RBC. 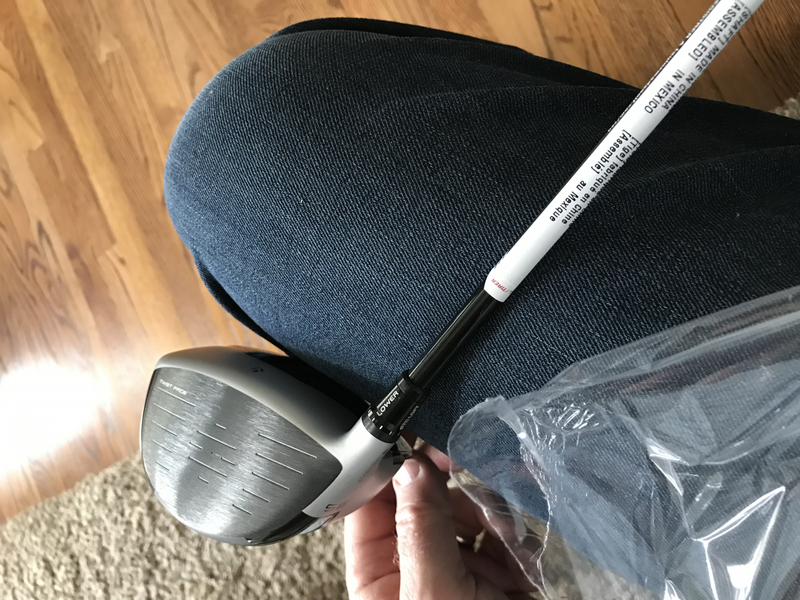 My pre owned club came brand new without a head cover and adjustment tool. This was a pleasant surprise to say BRAND new. I also caught the scratch in a pricing error while my club was in transit and they honored the $35 price drop by doing the right thing despite not having to do so. I�€™m a big believer in RBG and my many experiences prove they will make it right no matter the issue large or small. Thanks RBG! ProsPreowned like new club was ?brand NEW never hit?! So pleased! Bought these for my wife and she loves them. The condition was accurately described as they were used. Play with it the first time last week. I love it . When it arrive it was like a brand new club. I always happy with anything I gotten from Rock bottom golf.